BOLOBeat - One Touch Safety - ACES, Inc. The word is out about BOLOBeat! In the last two months, BOLOBeat has been presented and positively received at two major law enforcement conferences and the team has built relationships with key industry partners. 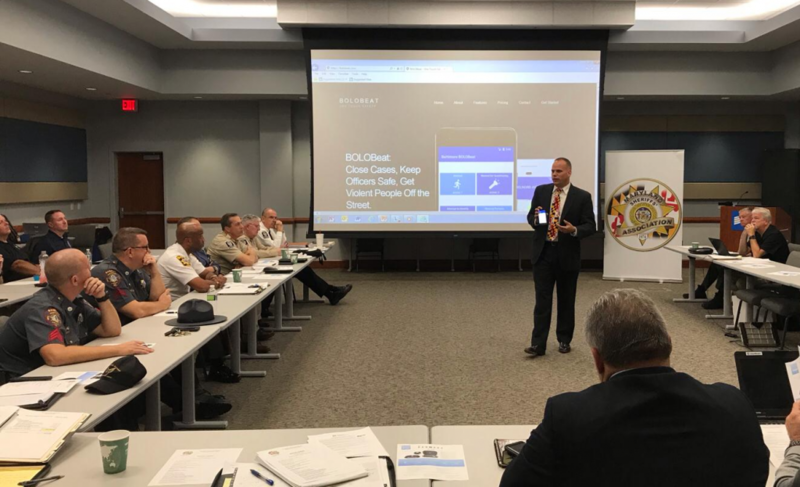 In October, Lt. Steven Olson had the honor of presenting BOLOBeat at the Maryland Sheriff’s Association. Thirteen Maryland counties were in attendance and the majority of these attendees have expressed interest in further discussion. Lt. Olson will be following up with the sheriffs and collaborating with them on how BOLOBeat can best serve their county. BOLOBeat representatives Lt. Steven Olson and Tony Alletag traveled to Baton Rouge, LA for the Southeastern Homicide Investigators Association conference. Lt. Olson gave a presentation in front of more than 350 Detectives and Law Enforcement professionals. His message that “with BOLOBeat in their toolbox, officers on the street will be safer, violent people would be removed from our neighborhoods, and cases in court will be stronger than ever” was received with enthusiastic applause. Current work involves testing and demonstrating the iOS version (previously, only an Android version was available) and creating a backend interface and database solution as an alternative to integration with current or legacy records management. Additionally, the team has met with and begun cultivating relationships with Mark43 and Amazon AWS, which could prove to be very advantageous partnerships all around. © Copyright 2018 by ACES, Inc. All Rights Reserved.